Attention: Now you can easily drop six strokes (or more) off your game without even blinking -- GUARANTEED! Imagine for a second, you are at the Mecca of Golf. One of the world's most prestigious golf courses beckons you. The sun is rising, warming the cool morning air blowing in your face. You look out over the oldest (and arguably best) course in the world, where the game has been played since the 15th century. You feel like you belong here. Your golf game is superb. Your putts are on target. Your drives straight and accurate. Your short game nothing less than magnificent. But it wasn't always like this, was it? Do you remember those days? When nearly every shot you took seemed laser guided to an obstruction, tree, sand trap, or worse? He did not win a major in either year. And in September, 2004, he was no longer the top ranked golfer in the world. Golf enthusiasts were buzzing about what happened to Tiger. Was it a rift with his swing coach Butch Harmon? Problems with his marriage? Health issues, no one knew about? Tiger himself said he was working on his swing and once the adjustments were complete he would return to form. But why did he, as one of the top golfers of all time, fiddle with his swing when he was on top of the world? You see... Tiger had realized he had learned some bad habits that would ultimately keep him from playing his best and that he had to fix them or face serious problems with his game has he got older. In order to improve your Golf game, you must follow a system. Otherwise you end up practicing the wrong things, the wrong way. The Long Game - i.e. tee shots, iron shots etc. The Short Game - i.e. pitch shots, bunker shots, chip shots etc. When Tiger looked at his game, he quickly realized two things: First, his putting (especially under pressure) is possibly his greatest asset. His putting won the the Arnold Palmer Invitational, after finishing the third round in a five-way tie for first place. And he completed his fifth consecutive PGA Tour victory with a dramatic 24-foot putt on the 18th hole to defeat Bart Bryant by a stroke. Second, he has typically been near the bottom of the Tour rankings in driving accuracy. Plus he was hoping to reduce the wear and tear on his surgically-repaired left knee, which was subjected to severe stress in the 1998-2003 version of his swing. So when Tiger looked at his game, it was obvious to him that the long game was his weakest area, and if he did not do anything about it, his knee might give out on him. So he focused on that area of his game. Tiger and his swing coach worked tirelessly on his swing. At first as he practiced and adjusted to the new form, his game slipped slightly. But once he was used to the new form, he started winning once more. And in 2005, Tiger regained his number one position. 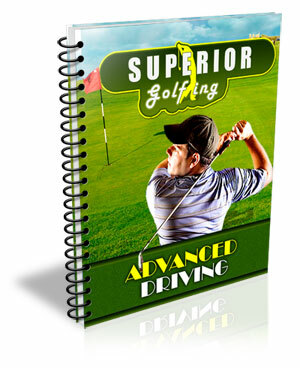 Superior Golfing works for all golfers. I have been a student of the game of golf for over 20 years. Through many (many) hours of hard work and refinement of my technique at my beloved Woodlands course, which I call my hidden paradise, I have developed Superior Golf skills. The technical workings of the game and psychology behind it have always fascinated me, and in my time I have gone on to coach several promising Junior and Intermediate level players in Oakland, Maine. It was there in Oakland that I developed Superior Golfing to help eradicate players' bad habits and bring their Superior game to the forefront... players like Martin below, who shaved a fast 5 strokes off his game! "...I shaved 5 strokes off my game!" "All I can say is Wow! I am shocked at how easy it has been for me to shave 5 strokes off my game! I have been stuck on a 14 handicap for 3 years now and I'd just about given up hope of getting any better. I'd tried coaching, but I really needed something to take away with me that I could work on and study by myself. 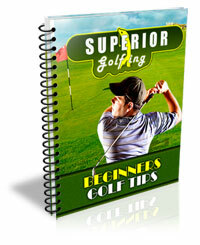 A No Nonsense Step By Step Guide To Superior Golf! Superior Golf isn't hypothesis or theory... it's step by step techniques with complete illustrations to help you improve your game and lower your score (quickly). This program is proven to work and will help you to consistently bring your best game to the course every single time. Master your grip. Most golfers never manage to hit their opening shot right, and the majority of this comes from an incorrect grip. Is your grip too open or too closed? Discover the correct way to grip your clubs and start launching your golf balls with the speed and accuracy of a laser missile! Discover how your aim can be vastly improved by making subtle changes to your body position. Use my quick exercise to make huge changes to the accuracy of your drive! Do you know how important your posture is to your shot? Let me show you precisely how you need to hold your body to deliver the best results time after time. You will wonder how you ever managed before! Do you know why the ball veers away to the left or the right when you hit it? I will show you where the optimum point to hit the ball is, and why this is crucial to the accuracy of your shot. You will start hitting the fairways and green shots with ease! Discover the difference between a masterful and a mediocre shot. Find out what exercises you should do before you tee off. Discover how you can get more distance out of your shot EVERY time you tee off. I will show you the secrets to maximizing the power of your swing. Perfect your club positioning at the time of impact. You'll soon see why this may be sharply affecting the distance your golf balls fly, and learn how to quickly correct this. Uncover a secret that is exploding driving distances regardless of a player's abilities. Get in on the latest information and fly past your distance goal today! Discover the difference between a chip and a wedge and how to use them to shave crucial strokes off your golf score. Discover the three most important factors that will affect the trajectory of your flight and where the ball lands. The Perfect pre-shot routine... It's amazing how a few brief moments make all the difference between a masterful shot and one into the sand trap.... again! I show you exactly what exercises set you up for the perfect shot every time! Let me show you how easy it can be to add new shots to your golfing repertoire. I break new shots down into a series of easy, methodical steps. This is so sweet, golfers of any age can master this! Do you panic when you get stuck in a bunker? Take a deep breath and discover how to hit the ball cleanly out of the sand and back onto the green. You're about to learn how to perfect your follow through, step-by-step. This will make BIG DIFFERENCE in your golf! Especially in your chipping and wedging game. Have you found yourself in some difficult positions out on the course and wondered how you are going to get the ball back onto the green? You're about to discover all the shots to get you out of any situation you find yourself in! You will wonder how you ever managed before. Discover if your putter is square on or not. Do you know when it isn't? .. Really? Use my techniques to make huge changes to the accuracy of your stroke! Have you discovered the secret to swinging straight? Try my no-fuss lesson that is going to sharpen your skills in minimum time. A few minutes of this every time you have a spare few moments is going to do wonders to your game! Professional golfers talk about the "sweet spot" Let me show you what this is and how important it is to delivering a putt like a pro. Before you step up and have a putt, have you thought about your grip? Get it right from the start and learn why the way you grip a putter is crucial to your putting game. And you get all this and more for a mere fraction of what it would cost you for private, one-on-one tuition that you receive at the golf course! You will be laughing all the way to a lower handicap. Strike Your Ball Long And Straight... Everytime?!? Do you want a golf swing that will easily hit your shots consistently 30-50 yards longer than you are now? Do you want a smoother, more efficient golf swing that will hit your shots straighter and further with less effort? Do you want to confidently hit your driver straight and long off the tee making golf easier, less frustrating and more fun? You see, the ball striker you are today is the result of the habits that you've created. And so the only way to improve your ball striking is to improve your golf swing habits. So as you're sitting there reading this, imagine you've created a superior golf swing and now you can hit the ball 30-50 yards further than you were yesterday. How to add HUGE yardage to your drives while maintaining laser accuracy! You see, when The Long Game Improvement Program is finished, you'll be easily hitting a strong, consistent golf swing, every single time! Hi I'm Cath and I've been learning the game of golf. And I'm either having a great time at it and fluking some awesome shots that get you going, but otherwise I'm having a really frustrating time. So I got the book "Superior Golfing" and it has been a great help for me. ....Just small things and it's hugely improved my game and I'll take that further and I really recommend the book. So if anyone would like help with their golf, I recommend Superior Golfing"
"...made it a lot easier for me!" "Jack, I have had no previous golf experience and found the idea of going to the golf course quite daunting. That was until I was recommended to try 'Superior Golfing". The clear instructions and pictures made it a lot easier for me (the complete novice) to practise the different strokes and get the feel of the game. Are You Ready To Start Hitting Long, Straight Drives... Sinking Impossible Putts... And Chipping Your Ball Out Of The Toughest Sand Traps And Back Into Play? The Average Price for 3 days at a Top 25 School in the USA is $1,108. That does not include travel costs, accommodation etc. Most golf schools take from 1 to 3 days of your valuable time with a set schedule and place. You have to be reasonably golf fit to attend a golf school because you'll be hitting a lot of balls and practicing a lot. If you're not reasonably golf fit, you'll get very sore and may even injure yourself. So you can learn and practice at your own speed in your own home... At a fraction the cost of an expensive Golf School. But Superior Golfing is only going to cost you just $99.95 $49.95 (see important update below). And you don't have any traveling costs (apart from going to the range when you want). You don't have any hassles of getting to the golf school. You don't have to spend hour upon hour practicing. You practice when and where you want. And obviously it's a lot cheaper than a normal off-line golf school, with far better results in most cases. And Get This... You Only Pay When You Play Better! That's right -- you only pay for results. Because when you join Superior Golfing now you get an 8 week money back guarantee. If you're not happy with it for any reason within 8 weeks of joining you can get 100% of your money back -- without any hassles. YES!...you have 8 weeks to try out the course and if you don't improve or think you will improve then simply get your money back. When you join the online Superior Golfing now you'll receive FREE the digital version of my 159 page Beginner's Golf Tips ebook that regularly sells for $19. With the helpful aids found in this book, and the plethora of diagrams, pictures, sketches and step by step items to practice, along with an explanation of difficulties to look for, all that could be a thing of the past. You are well on your way to discovering exactly what it is that causes you trouble and how to fix it, shaving strokes off your game almost immediately! I will discuss the mental and physical aspects of the game, and start with basics, things like terms and definitions, so that all the advice and tips are clear and understandable. I will go through the beginner’s necessities (that never hurt the experienced golfer to freshen up on!) and continue on to address more advanced elements of the game. If you have ever wondered which is more important, the long and short game, ponder no more, I cover all aspect of it throughout the ebook. Remember you get it FREE when you join! Do you want to consistently hit your chip shots so they either go in the hole or leave an easy tap in? Do you want to discover how to master bunker shots so you'll love it when you see your ball in the bunker? Do you want to learn how you can consistently hit your pitch shots a specific distance -- just like a machine? And you've probably already tried many things to improve your golf game which haven't worked, and that's naturally going to leave you skeptical of anything that promises to improve your golf game. So that's why I've put together a superior short game improvement program. Do you want to stop 3 putting and hole more first putts (especially in the 10 feet and less range)? Do you want to be able to quickly and easily read the greens so you know the best line and speed your ball needs to travel on to go in the hole? Do you want to improve your distance control so you consistently leave easy tap-ins? The putting you do today is the result of the habits that you've created. And so the only way to improve your putting is to improve your putting habits. 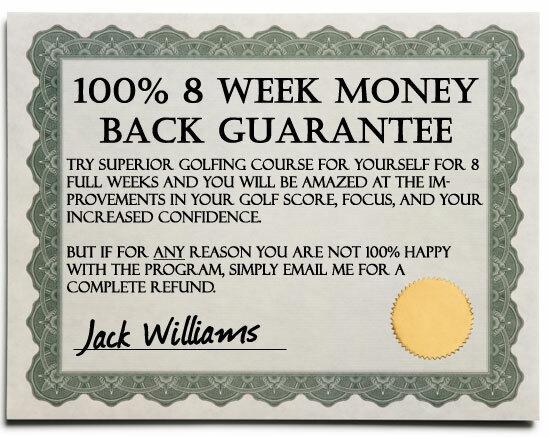 My 100% No Risk, 8 Week "Hole In One" Money Back Satisfaction Guarantee! Join me today with absolutely no risk. Test at least THREE lessons on your golf game for a minimum of 30 days over the next 2 months. If you don't see a tremendous improvement in your putting, slicing, hooking or driving, send me an email with your results within the next 2 months, and I'll instantly refund your membership, no questions asked. And of course, if you don't like the school for ANY reason (even if it's because you decide 7 weeks, 6 days from now that you don't like the Superior Golfing logo! ), just shoot me an email in the next 8 weeks to let me know, and I'll instantly issue you a complete refund, no questions asked! Do you keep using the same bad habits that generate poor golf scores? Or do you take a serious look at the positive impact Superior Golfing is having on the golf scores and confidence of other highly successful golfers (people like Harvey, Frances, and 67 year old, Bob Gibbs!)... and decide to make your OWN decision based on your OWN results? ... Remember, there's absolutely no risk. You have 8 weeks to try Superior Golfing and watch your golf score plummet... Drive the ball straighter like Martin... Putt with confidence like Cathy... and see exactly how your golf game and scores improve. If you're not 100% convinced after 8 weeks, just let me know. What are you waiting for? Sign up right now -- and claim your Superior Bonuses (valued at $57 but yours FREE!) before it's too late. Then click the order button in the acceptance form below and get started immediately! Yes, Jack! I want to lower my golf score by at LEAST six strokes and increase my distance and accuracy -- FAST. Jack, please sign me up immediately for your amazing Superior Golfing course, available by instant download -- with NO waiting. I am ready to putt with confidence, drive further and straighter than ever and master my short game. I understand that once I join, I will be taken to an exclusive student page where I can instantly download your entire Superior Golfing course. I also realize that I'm going to get your 3 Superior Bonuses outlined above worth at least $57, including "Beginner Golf Tips", "Advanced Chipping", and "Advanced Putting". I further realize that because I'm joining before April 26th, 2019 I can take advantage of the new edition update special and receive instant download access to Superior Golfing for an incredibly low $99.95 $49.95. Not only that, you've eliminated any risk with your 8 week 100% "Hole In One' Money Back Satisfaction Guarantee! Superior Golfing is open -- even if it is 3am!